Established in 2003, the Rady School of Management achieved accreditation from the AACSB in 2011. The Rady School is one of the youngest in the nation ever to achieve AACSB recognition. UC San Diego has a community of international students, and the school has produced 16 Nobel Laureates and eight MacArthur Foundation award winners. 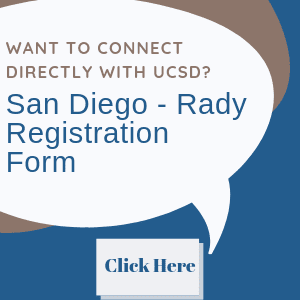 Rady is located on the campus of UC San Diego on 1,200 acres of coastal woodland in La Jolla, California. The campus is situated near the Pacific Ocean, in the second-largest city in the state. The campus is located less than 15 miles away from the San Diego International Airport. The Rady campus features four large seminar rooms with theater seating, a 300-seat auditorium, smaller classrooms and multipurpose rooms, conference rooms, a library, a student center, the Sony Electronics Suite, the Executive Development Suite, and faculty and staff offices. Recent figures note that the Rady School has 44 total faculty members. The professors are experts in their fields, and their work has been featured in many publications such as the Harvard Business Review, Management Science, Journal of Consumer Research, and Cognitive Psychology. 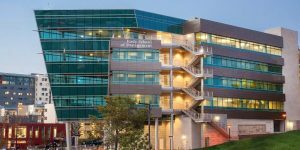 The Rady School of Management currently has approximately 60 students in the full-time MBA class, between 35-40 in the FlexEvening MBA program, and 25-30 in the FlexWeekend class. The Rady School offers a full-time MBA that typically takes 21 months to complete (usually with a summer internship after the first year). The FlexEvening MBA requires 30 consecutive months, whereas the FlexWeekend MBA takes 24 consecutive months. Thank you for your interest in the Rady School of Management. Please take a moment to complete the following form, and someone from the Rady School of Management's admissions team will contact you shortly with additional information on their program.